The Dark Cloud Cover is a bearish reversal signal. Think of this candlestick charting pattern as a partial solar eclipse blocking out part of the sun. A Dark-Cloud Cover Pattern occurs when a bearish candle on Day 2 closes below the middle of Day 1's candle. In addition, price gaps up on Day 2 only to fill the gap and close significantly into the gains made by Day 1's bullish candlestick. The rejection of the gap up is a bearish sign in and of itself, but the retracement into the gains of the previous day's gains adds even more bearish sentiment. Bulls are unable to hold prices higher, demand is unable to keep up with the building supply. Since the Dark-Cloud Cover is a bearish reversal signal, it must come after a rally. Second day closes within but below the midpoint of the first day’s body. The greater the penetration of the black body's close into the prior white body, the greater the chance for a top. In an uptrend the market gaps open, but loses ground to fall below the midpoint of the previous day. The-Dark Cloud Cover pattern suggests an opportunity for the shorts to capitalize on the next day’s open: a warning sign to bullish investors. The-Dark Cloud Cover pattern is the opposite of the Piercing Line pattern. 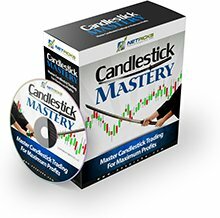 Another prime use of this candlestick charting pattern is utilizing it as a prior resistance area. Return from the"Dark-Cloud Cover" to the Home Page: "Stock Market for Beginners"